Lord, renew in your Church the spirit you gave Saint Augustine. Filled with this spirit, may we thirst for you alone as the fountain of wisdom and seek you as the source of eternal love. We ask this through our Lord Jesus Christ, your Son, who lives and reigns with you and the Holy Spirit, one God, for ever and ever. Amen. St. Augustine (354-430) was born at Tagaste, Africa, and died in Hippo. His father, Patricius, was a pagan; his mother, Monica, a devout Christian. He received a good Christian education. As a law student in Carthage, however, he gave himself to all kinds of excesses and finally joined the Manichean sect. 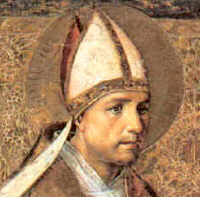 He then taught rhetoric at Milan where he was converted by St. Ambrose. Returning to Tagaste, he distributed his goods to the poor, and was ordained a priest. He was made bishop of Hippo at the age of 41 and became a great luminary of the African Church, one of the four great founders of religious orders, and a Doctor of the universal Church. Before the reform of the General Roman Calendar today was also the feast of St. Hermes, a martyr of Rome, probably in Diocletian's persecution. He was buried in a cemetery on the Salarian Way. He is mentioned in the Depositio Martyrum of the year 354. Augustine Aurelius was born on November 13, 354, in Tagaste, North Africa. His father was a pagan, his mother, St. Monica. Still unbaptized and burning for knowledge, he came under the influence of the Manicheans, which caused his mother intense sorrow. He left Africa for Rome, deceiving his mother, who was ever anxious to be near him. She prayed and wept. A bishop consoled her by observing that a son of so many tears would never be lost. Yet the evil spirit drove him constantly deeper into moral degeneracy, capitalizing on his leaning toward pride and stubbornness. Grace was playing a waiting game; there still was time, and the greater the depths into which the evil spirit plunged its fledgling, the stronger would be the reaction. Augustine recognized this vacuum; he saw how the human heart is created with a great abyss; the earthly satisfactions that can be thrown into it are no more than a handful of stones that hardly cover the bottom. And in that moment grace was able to break through: Restless is the heart until it rests in God. The tears of his mother, the sanctity of Milan's Bishop Ambrose, the book of St. Anthony the hermit, and the sacred Scriptures wrought his conversion, which was sealed by baptism on Easter night 387. Augustine's mother went to Milan with joy and witnessed her son's baptism. It was what it should have been, the greatest event of his life, his conversion — metanoia. Grace had conquered. Augustine accompanied his mother to Ostia, where she died. She was eager to die, for now she had given birth to her son for the second time. In 388 he returned to Tagaste, where he lived a common life with his friends. In 391 he was ordained priest at Hippo, in 394 made coadjutor to bishop Valerius, and then from 396 to 430 bishop of Hippo. Augustine, numbered among the four great Doctors of the Western Church, possessed one of the most penetrating minds of ancient Christendom. He was the most important Platonist of patristic times, the Church's most influential theologian, especially with regard to clarifying the dogmas of the Trinity, grace, and the Church. He was a great speaker, a prolific writer, a saint with an inexhaustible spirituality. His Confessions, a book appreciated in every age, describes a notable portion of his life (until 400), his errors, his battles, his profound religious observations. Famous too is his work The City of God, a worthy memorial to his genius, a philosophy of history. Most edifying are his homilies, especially those on the psalms and on the Gospel of St. John. Augustine's episcopal life was filled with mighty battles against heretics, over all of whom he triumphed. His most illustrious victory was that over Pelagius, who denied the necessity of grace; from this encounter he earned the surname "Doctor of grace." As an emblem Christian art accords him a burning heart to symbolize the ardent love of God which permeates all his writings. He is the founder of canonical life in common; therefore Augustinian monks and the Hermits of St. Augustine honor him as their spiritual father. Patron: Brewers; diocese of Bridgeport, Connecticut; Cagayan de Oro, Philippines; diocese of Kalamazoo, Michigan; printers; city of Saint Augustine, Florida; diocese of Saint Augustine, Florida; sore eyes; diocese of Superior, Wisconsin; theologians; diocese of Tucson, Arizona. Symbols: flaming heart pierced by two arrows; eagle; child with shell and spoon; word Veritas with rays of light from Heaven; chalice; dove; pen and book; scroll; scourge; model of a church; Bible opened to Romans XIII; child; shell. St. Hermes was prefect of Rome. Along with Pope Alexander I, he was put to death about the year 116. A cemetery on the Salerian Way bears his name. The Roman Martyrology reads: "At Rome the birthday of St. Hermes, a man of rank, who (as the Acts of the martyr-pope St. Alexander I narrate) was first cast into prison and then beheaded along with many others. He gained the martyr's crown under the judge Aurelian." His body rests in the Church of St. Mark, Rome.